Metorik offers cart tracking through the Metorik Helper plugin you install on your website during the setup. You need to be running 1.0.0 or higher to use it. If at any time you'd like to disable cart tracking, you can do it from this page as well. Keep in mind, WooCommerce does not track carts at all, so we can only provide data about them from when you enabled cart tracking in Metorik. Move email field to the top of checkout: This setting will try move the email field to the top of the checkout. 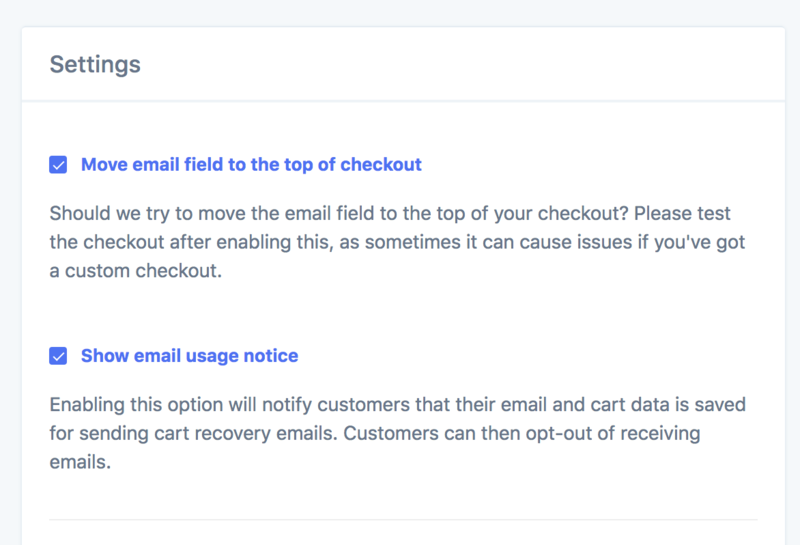 This can help capture emails before checkout is abandoned, but if you have a custom checkout or have configured the checkout's fields, it may cause problems. Try enable it though and check that everything looks good on your checkout afterwards. Show email usage notice: Enabling this setting will [attempt to] show an email usage notice under the checkout's email field and under the email field of the 'add to cart email popup'. This explains to customers that you're storing their carts and may email them about them later. It also gives them a way to opt-out of your cart emails and prevent Metorik from storing details about their carts in one-click. You can easily translate the text shown using any WordPress translation plugin you'd normally use. The text domain is metorik. 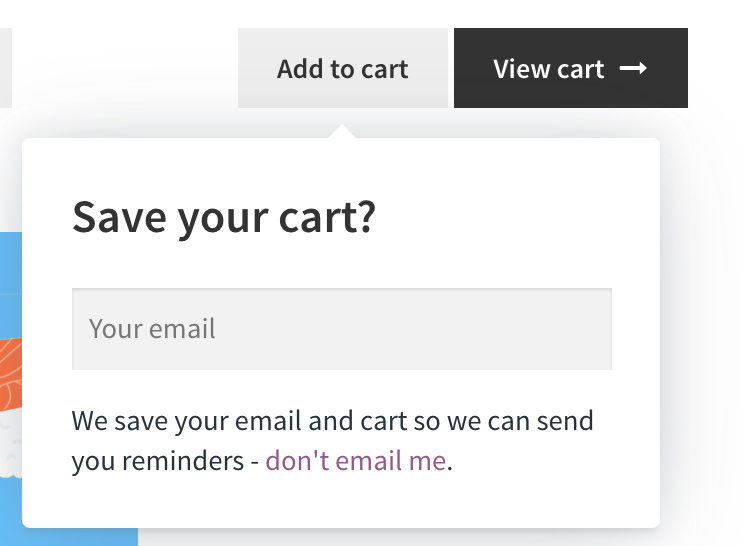 Add to cart email popup: When enabled, we'll try to show a small popup/tooltip whenever an item is added to the cart. In there, we ask for the customer's email, giving us the chance to email them later if they don't checkout. This popup will only ever shown once and will only show for guests, as we'll already know the email of logged-in customers. If it's an AJAX add to cart button the an archive page, we'll try show it right there. If it's a single product page add to cart button, where the page reloads after an item is added to the cart, we'll try show it after the page reload. If your store takes customers to the cart page after adding an item to their cart, we'll try show it there next to the 'Processed to checkout'. You can disable this one by using this code/filter. By default, it will be placed below the bottom. You can change this and make it on the left for example, by filtering 'metorik_acp_placement'. So this code for example will place it on the left. The next setting - Add to cart popup title - lets you change the Save your cart? text to anything else. As soon as the customer's entered a valid email into the email field, we'll link it to their cart. Of course, you're welcome to customise the template of the popup. To do so, simply add a add-cart-email-form.php file in your theme under a new metorik folder. So in your theme's folder, you'd create a metorik folder. And then inside of that, you'd create a file named add-cart-email-form.php. You should start by copying the contents of the original template file here. Let us know if you need a hand doing this. Whenever an item is added to a cart, removed from a cart, or any cart-related update happens, your store will send the data to Metorik for storing. No cart data is stored on your site at all, and sending data from your site to Metorik is very quick and has zero impact on your site's performance. 1. All carts by logged-in customers. 2. All carts by guests that entered their email through the 'add to cart email popup' or on the checkout page. We ignore carts without emails as since they don't have any customer information attached to them, we don't want to report on them - this helps keep your data as accurate and reliable as possible. We're considering storing this data in the future, but for now we aren't seeing enough compelling reasons to. For more on cart tracking consent + GDPR, please see this help doc. Requires Metorik Helper 1.0.4 or higher. You can view a variety of cart-related reports and stats from the carts report here. To learn more about cart reports, please see this help doc. In Progress: When a new cart is in-progress. Normally it will have this status right after the cart has started, up until an order was placed or the cart was considered abandoned. Placed: When a cart is started and the order for it is created in the same session (before the cart has been considered abandoned), it will be given the placed status. You'll be able to see the order that was placed for the cart. Abandoned: When a new cart has not been updated in 30-60 minutes, we'll consider the cart to be abandoned and mark it as such. Recovered: When an abandoned cart has been recovered through a Metorik cart recovery link, we'll consider the cart to be recovered. More about cart recovery below. 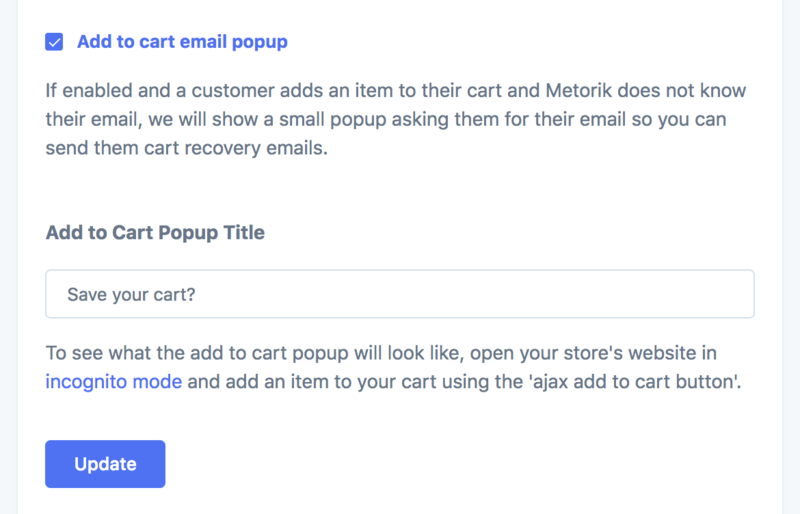 Using Metorik Engage, you can automatically send cart recovery emails to abandoned carts. To learn more about sending cart recovery emails with Engage, please see this help doc.